Today, December 10th, is Human Rights Day. The adoption of the Universal Declaration of Human rights took place just four years ago in the General Assembly of the United Nations. The Declaration has come to be recognized as a goal of rights and freedoms for all nations - all comminities - all individuals. And now, in literally dozens of nations around the world the historic adoption of the Declaration is being celebrated. 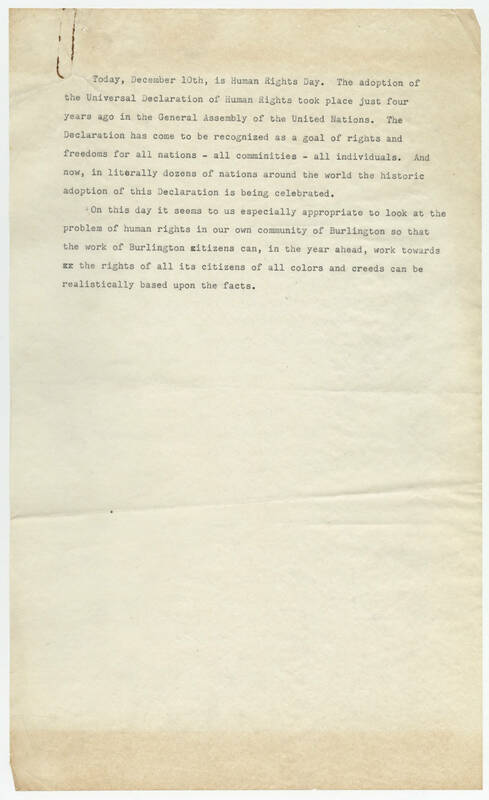 On this day it seems to us especially appropriate to look at the problem of human rights in our own community of Burlington so that the work of Burlington citizens can, in the year ahead, work towards the rights of all its citizens of all colors and creeds can be realistically based upon the facts.